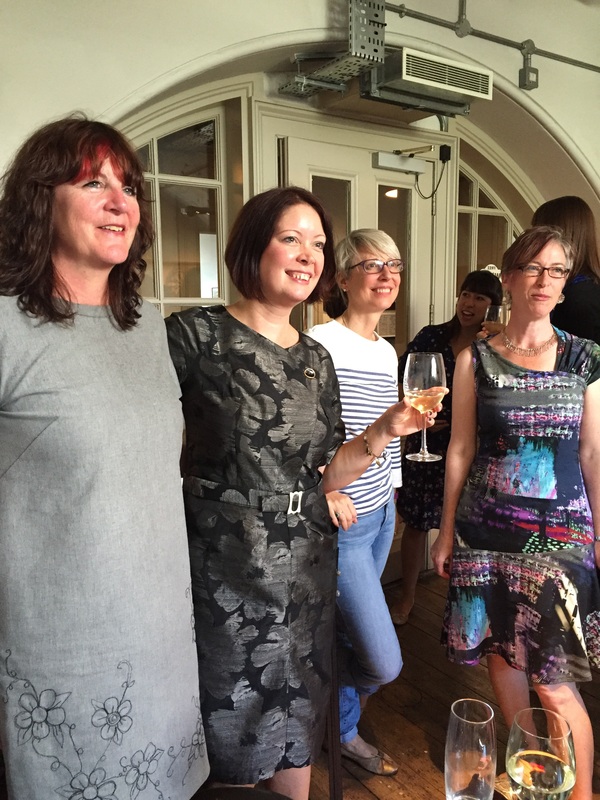 Having not only created the Made Up Initiative to raise funds for the National Literacy Trust, Karen from did you make that also organised a Meet Up in London on Saturday for those taking part. Not one to miss out on the opportunity to spend a day in London, W came with me (not to the Meet Up!). I wore the Brumby skirt I’d pledged to make and my latest Get Shirty Refashion (not yet blogged) and W wore an eye-catching combination for safety reasons as he was planning to hire a ‘Boris Bike’ for getting around. I wasn’t keen to join him on two wheels so in the end we agreed to walk. As we passed Portland Place he spotted three young people playing table tennis in the World Piazza at the front of Broadcasting House. He will play table tennis at any opportunity so asked if they wanted a game of doubles – and they said yes! I just loved the very stylishly dressed man who sat down in the foreground with his yellow coat, striped socks and floral tie. The boys seemed genuinely disappointed when I dragged W away. The Meet Up was in the Parcel Yard on the concourse at Kings Cross Station. It was rather exciting actually meeting Karen as I’ve been following her blog for a long time and she is just lovely! She was a very generous host, not only providing refreshments but also bringing along fabric and patterns from her stash to give away. Her Vogue dress was fabulous. You should look at it in more detail here. At 1.30 there was a draw for the three prizes which Karen managed to broadcast live on Periscope despite the thickness of the building’s walls making internet access somewhat intermittent. This was the first meet up I’ve been to and it was great talking to other bloggers including these three pictured with Karen. left to right Gill from vintagerockchick had made a Mortmain dress but didn’t wear it as she is saving it for her great niece’s christening. She’d brought along a photograph of the dress and a piece of the fabric which was gorgeous. Kate from Fabrickated was wearing this coat (but not in the photograph sadly, it was lovely) and Tamsin from pimp my curtains had taught herself to knit recently and made this scarf – which was far too cosy to wear on Saturday. Next stop was extracting W from a beer festival round the corner from the station and heading for a late lunch at The Grain Store. Very lively location but rather random service. We then made our way along the Regent’s Canal to Camden Market before heading back to Victoria. At the start of this walk we came across a lady in a narrow boat selling home baked cake. Who could resist? According to the Health App on my iPhone we clocked up around 23,000 steps during the day which entitled us to do almost none on Sunday! The Brumby skirt was more comfortable than I thought it would be given the somewhat rigid nature of the fabric, although there was a slight pocket failure when the additional securing stitches on one side came adrift. Too much shoving of hands in pockets + poor stitching. Easily rectified. A great day and a big thank you to Karen for organising the fundraising initiative and the Meet Up. Whew what a day. Didn’t you fit a lot in! Isn’t W marvellous just taking on those boys for a game of table tennis. What a lovely round up of the Meet Up and of your day.! I’m definitely going to investigate Granary Square soon, and walk along the canal. I’ve meant to do it for years, but never got around to it. The walk along the canal is fascinating – all life is there, that’s for sure! We’re planning a longer walk next time – with cake, obviously! Lovely round up! May I share the Make Up photo on Instagram? It’s a great shot! Absolutely! Share away. Thank you! I had a great day and made some lovely new blogging friends. I so enjoyed the ping pong story. It also sounds like you used the day really well. Sorry the Grainstore was a bit hit and miss – I eat there frequently and it is normally very good indeed. And of course it was lovely to meet you, Gill and Tamsin. We are inclined to pack a lot into a day out. Unusually there was no fabric shopping involved!